Commissioned by MIRA, VITO developed a prototype or blueprint for a 'system dynamics model for Flanders'. A system dynamics model captures the dependencies between the state variables that drive the dynamic behaviour of a system. This allows to calculate different combinations of scenarios and policy choices in a consistent manner, and to determine the medium- and long-term impact to be determined. For the preparation of the so-called blueprint various workshops were organised where experts and stakeholders could formulate proposals for improvement of the model. System Dynamics Modelling originates in the World Model, which was developed for the Club of Rome in the late 1960s. System dynamics models are very useful for supporting long-term prospective studies and policy analyses. The purpose is to identify the "tipping points" which cause the system to change its behaviour significantly, for example from an equilibrium to a non-equilibrium state, rather than obtaining an accurate and very detailed prognosis of a system's behaviour. At the same time, a system dynamics model provides a practical analytical framework to support the integration between relevant themes such as mobility, energy, demography, environment, agriculture, etc. and the available (computational) models. Where more depth and detail are required, the causal relationships within the system can be described by means of thematic models. 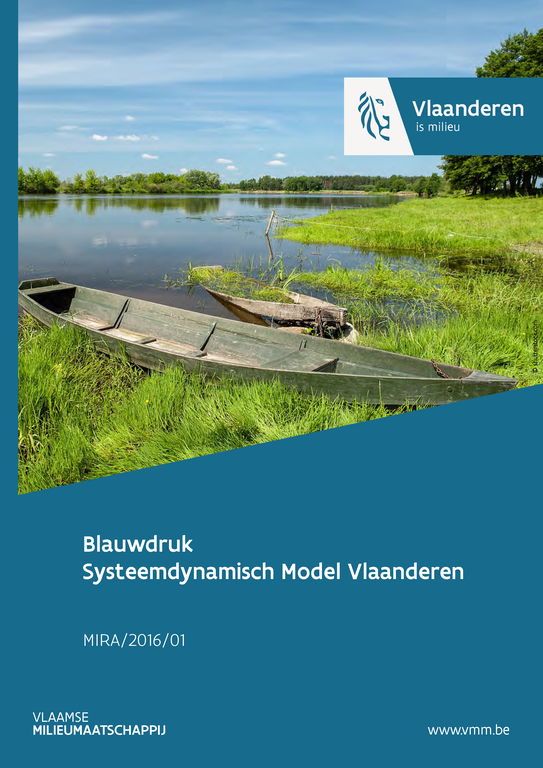 In August 2013, VITO completed the 'Feasibility study for system dynamics modelling and interaction with thematic modelling' (Dutch report with English summary) commissioned by MIRA. The purpose of this study was to explore the possibilities for developing a system dynamics model for Flanders. In addition to identifying the technical possibilities, step 1 of the 4-step plan was implemented.